ffsend is a command line Firefox Send client that's currently in alpha, available for Linux, macOS and Windows (with only macOS and Linux binaries being available right now). With ffsend you can easily and securely share files from the command line, by making use of a Send, a Firefox test pilot project. Firefox Send is a file sharing experiment by Mozilla, which allows sending encrypted files to other users. 'Send' can be installed on your own server, or you can use the Mozilla-hosted send.firefox.com. The latter officially supports files up to 1 GB (but I could upload a 2GB file, as mentioned by the ffsend description), with each link expiring after a configurable download count (defaulting to 1 download) or 24 hours, while also deleting all the files from the Send server. Read more about the Send Firefox Test Pilot. 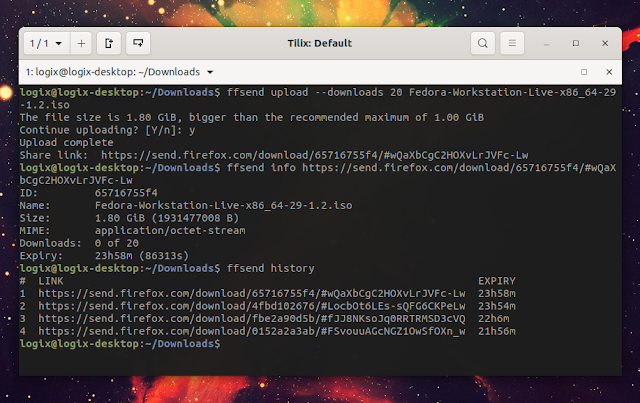 ffsend can both upload and download files, while the remote host can use either ffsend or a simple web browser (that doesn't have to be Firefox) to download the file. One could always use the send.firefox.com web interface to upload and download files, but ffsend is intended for usage in scripts, without interaction. You can also use it for a quick file upload or download that doesn't require opening a web browser. While ffsend uses client-side encryption, ensuring that all files are encrypted before they are uploaded to the remote host, anyone with the link can download the file, so make sure you don't share it with unauthorized people. That's because the encryption secret, which is used to decrypt the file when downloading it, is included in the share URL. An extra level of protection is available - you can password protect the file by appending --password when uploading a file using ffsend, or by setting the password after a file was uploaded, by using ffsend password URL -p YOUR-PASSWORD. Upload and download files and directories. For directories, ffsend will offer to archive the contents before uploading it. While ffsend supports Linux, macOS and Windows, there are only macOS and Linux binaries for download right now. For Debian, Ubuntu, Linux Mint and other DEB-based Linux distributions, all you have to do is download and install the ffsend DEB package. Replace file.ext with the file you want to upload. NN being the number of allowed downloads before the link expires (between 1 and 20), and URL the Send URL. Fore more on ffsend, see its README and check out ffsend --help.